Generous dollops of love and warmth were doled out Friday evening, January 28th, at Harvard University’s venerable Sanders Theatre, when the Boston Landmarks Orchestra presented its ninth annual Winter Concert, aptly entitled “Love’s Muse.” Though the BLO’s founder, Charles Ansbacher, passed away last fall, his labor of love lives on in the Free For All Concert Fund, created by the Maestro in the final year of his life. Tonight’s free concert, sponsored by this new foundation, keeps Ansbacher’s dream of making orchestral music accessible to all very much alive. The glowing confines of Sanders Theatre filled rapidly to capacity, as music-lovers poured in to the warm hall, leaving the winter chill behind. The caramel-colored wood of both hall and instruments looked good enough to eat. Appropriately enough, we were treated to the musical equivalent of a box of pre-Valentine bonbons. And our emcee for the festivities? WCRB’s warm and effusive morning host, Laura Carlo, of course. What’s not to love? The hyper-familiar though most definitely neither moth-eaten nor moss-covered Overture to the Barber of Seville, composed by the irrepressible Gioacchino Rossini (1792-1868), got things off to a rollicking start. Guest conductor Ronald Feldman, whose precocious musical career began with his appointment to the Boston Symphony cello section at age nineteen, led the orchestra in a precise, if somewhat reserved, rendition. Tempi were a bit conservative; this realization seemed to lack Rossini’s inherent freneticism, urgency, and propulsion. Indeed, the menagerie of Loony Tunes cartoon characters that this piece inevitably conjures in my mind’s eye appeared a tad less frantic than usual. Though well played, with clear delineation of instruments — especially the woodwinds, the overall effect was a bit sedate. Maestro Feldman’s elegant and graceful conducting style was not particularly well suited for the likes of this hyperactive opera buffa overture. Still, an amusing romp; just a somewhat staid amusing romp. Our next musical confection was Frédéric Chopin’s Piano Concerto No. 2 in F minor. Written when Chopin was just nineteen and premiered with composer as soloist shortly after his twentieth birthday, this is a lush, quintessentially Romantic work showcasing the lyrical possibilities of the intrinsically percussive pianoforte. Tonight’s soloist was one of Greater Boston’s own: the disarmingly youthful Kadar Qian, who hails from the exurb of Westford. At the tender age of thirteen, Qian has already compiled a startling number of concerto performances and successful competitions. His realization of Chopin’s masterwork was technically impressive, though somewhat lacking in lyricism. Kadar’s approach seemed to be fundamentally analytical, which manifested itself in a bit too much portato, an underutilization of the damper pedal, and a minimum of phrasing, all attributes more suited to the works of Bach. The compositions of the great Romantics require the expression of elegant, long lines and call for the performer to really “dig in” to the instrument, characteristics that were not apparent in this performance. Undoubtedly these musical attributes will come with maturity. At this stage of his development, Master Qian would be better served focusing on works that play to his prodigious technical and analytical strengths, specifically creations from the Baroque and Classical eras. This Wunderkind obviously has formidable and multifaceted gifts; it will be fascinating to chart his path across the musical firmament. As in the opening piece, this work featured solid playing by the orchestra, with coherent strings and clear winds. Feldman’s tempi were again on the conservative side, and the final Allegro lacked playfulness. All that said, it was indeed a rare treat to witness this admirable performance by a bona fide piano prodigy. 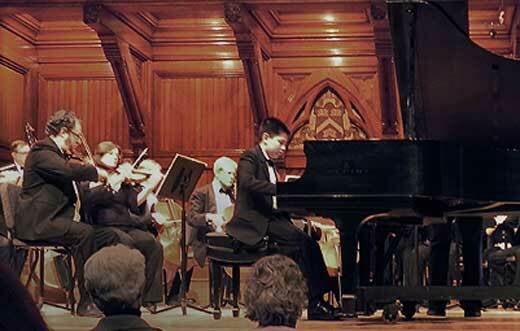 In response to an enthusiastic standing ovation, Master Qian rewarded us with a sweet lullaby, Chopin’s Berceuse, Opus 57. And finally, what heart-shaped box of musical sweets would be complete without a bit of Mozartian marzipan? Symphony No. 36 in C Major, K. 425, the Linz, rounded out the evening’s offerings and actually proved to be the artistic high point. Feldman seemed to be in his element here: tempos were pleasingly brisk; the overall energy level noticeably higher. After a slightly ragged first fistful of bars, the strings settled in and the piece really got rolling. As the tidal wave of notes was washing over us, it gave me pause to contemplate the fact that this large-scale work was created by the newly-married Herr Mozart in a mere four days. Without a MIDI! After a warm and appreciative ovation, Feldman and crew generously offered us one more savory: the luscious Valse from Tchaikovsky’s Serenade for Strings. My blood sugar was through the roof at this point, but who cares? Cozy, honey-lit hall full to bursting with music-lovers; a succession of Laura Carlo’s Greatest Classical Hits: all quite delectable. Definitely warmed both cockles and cochleae. Heartening to see that Charles Ansbacher’s dream lives on. What’s not to love?